It's our third anniversary at the House Mouse and Friends Monday Challenge. And we are celebrating! Our super talented teammate, Natascha has chosen the theme "Birthday" (with flowers optional). We are having a blog hop for prizes. There are prizes on the main blog and some of the gals have prizes on offer on their individual blogs. What's a birthday without cake. This little Gruffie is already digging in. The cake is soft yellow flower soft. I made a shaped card (Party Hat). Papers are Martha Stewart along with the border punch. Shiny white ribbon used for the top of the hat. The blue buttons are also Martha Stewart. Colored with Copic Markers. Used Star Dust Stickles on the background ribbons and the flowers on the cake plate. Sponged blue ink around the edges of the stamped image. We are sponsored by Simon Says Stamp, who has generously offered a $25 Gift Card to their online store. House Mouse Designs, had generously offered a $25 Gift Card to their online sotre. Pizzazz Aplenty, who has generously offered a $10.00 gift package of embellishments. And, more prizes scattered in our design team lineup. Lots of good stuff up for grabs! What do you have to do to be in to win the prizes? Just enter a card in our Birthday Challenge to celebrate 3 years for our House Mouse and Friends Monday Challenge. Leave a comment on the main House Mouse Challenge Blog And at each of the Design team members, past and present listed above. Then winners for the various prizes will be chosen by Random.org. For my prize, I would hope you follow me as I love sending one of my cherished followers a package, but it is not a requirement. Hope you can join our party. Take a look at the design team cards for inspiration, then ink up those stamps and join us. Vicki has joined our team permanently, and we welcome her with open arms, so glad to have her with us. So, if you're coming from Sue Kment's blog your in the right place. After you have left a comment, continue on to Stacy's blog. Очень красивая открытка. Мне нравятся все штампы от House Mouse!! wauw sue what a stunning card, love the way you colourd that image!!! Love your Hat.. that little guy ejoying his cake looks fo real with the flower soft.... Very will done!!! Oh and the Candy too!!! Thanks for the chance at that too!! Cute party hat with lovely colouring...great bloghop! Hi Sue another stunning Gruffie creation love the use of flowers soft on the cake..that Gruffie sure looks hungry..fab colouring great shaped hat..awesome GF. I can't believe how you used the flowersoft! Its just wonderful! I can almost taste the crumbs and sweet spongecake, how fun and fabulous! Just love the hat and the picture! I love your design, gorgeous creation, and cute image. Creative genius! I still have a problem with a mouse eating cake instead of cheese. Goes to show no one can pass up chocolate! Totally cool! The flower soft for the cake is genius! Awesome. Hi Sue, what a fabulous card, the design is wonderful and your image especially so sweet Gruggie with a messy coat!!! Does look a the little little Blog Dog Keeley could would share!! Sue your shaped card is fab. Just adore this image & love the way you have used the flower soft. Sue, it is gorgerous - no a word to say how much it is beautiful! HEHEHEHE!!! LOVE THE CAKE and the cake crumbs on his face. GENIUS to use flower soft!!! WOW !!! that is a great effect!!! Sooo so cute! this is such a fun hop! Hmmm, I think I look just like this Gruffie when I eat my birthday cake! LOL Great card. Happy Birthday, HM. Such a cute party hat! The bear is colored so perfectly and that cake! Wow! I can almost taste it! Great job! Wonderful! I love the shape and how you used flower soft for the cake. Love it! That's an awesome idea with the cake :) I don't think I've ever seen that! Aw how sweet, love it. What a beautiful creation you made. Nicely done so with the cake. I love love love your party hat card! Your coloring is wonderful as always and such an adorable image. And that flower soft sure adds "real" dimension to the cake. Fabulous card - I LOVE how you've used the Flower Soft. Hi! 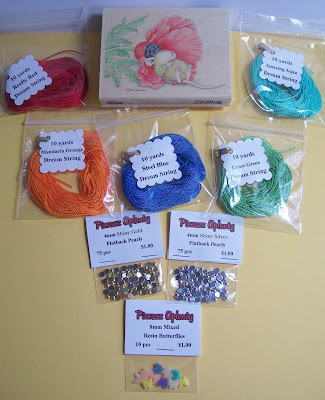 Sue,this is very lovely and your colours/colouring is just gorgeous-the flower soft looks amazing too!! thanks for your lovely comment and i am so **HAPPY**to have won and have 3 yummy new stamps on the way. OMG!!! I can't believe how cute that little guy is with the birthday cake all over his mouth!!! Just darling! 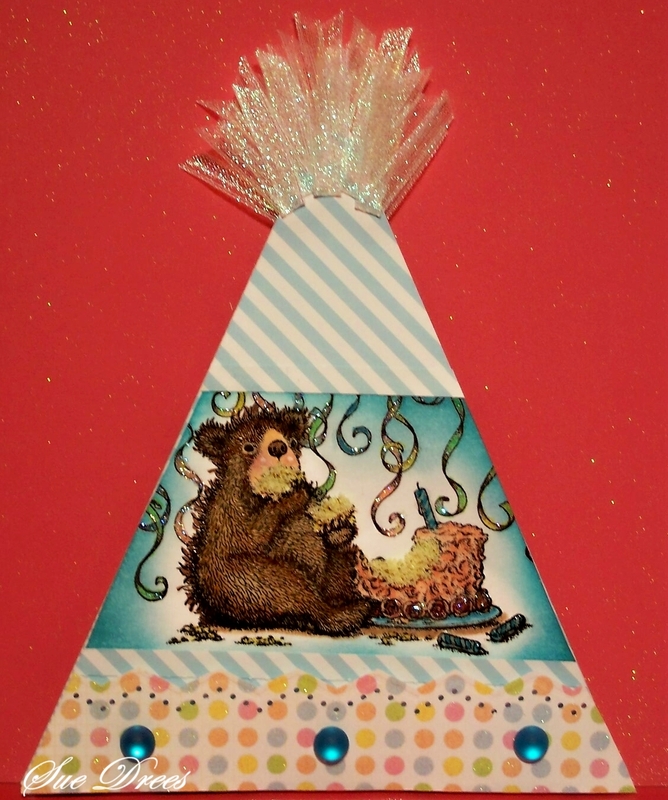 i so love the creative shape of your card Sue! The little puff on the end is the perfect touch!!! oh it's fab love it Sue! the flowers soft looks so real too.Brill! What a fun card! Love the flower soft on the cake, very creative idea! Sue your cake eating bear is so adorable! Love the use of the flower soft for cake! The hat shape looks wonderful! Ooooh I LOVE it :D that flowersoft cake is just perfect! Thank you for a brilliant hop and the chance to win some yummy candy. Happy birthday House-Mouse! Your creation is fantastic! 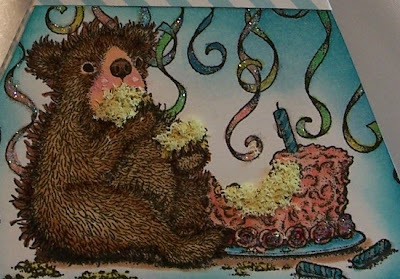 I Love the flower soft you added to make it look like this sweet cub is eating real cake and the sparkle you added to the streamers too. What a neat idea for flower soft!! its awesome use of the yummy cake!! Really cute idea to make the card as a party hat shape...simply adorable! Just lovely Sue, such a fun project. Brenda (No27 @ HM&F) and a follower, lol! Your card is absolutely brilliant! Fabulous shape and the flower soft is the perfect embellishment for that adorable image. Lovely card, like that its the shape of a party hat! Great party hat shaped card, love his cake - looks good enough to eat! Adorable!!! Great card!!! CUte party hat! What an adorable party hat! Just love it! You're so very creative. Lovely color and texture. Beautiful project. This is adorable. Seriously--it couldn't be any cuter. Using flower soft for the cake is genius (although it probably doesn't taste quite as good as real cake--LOL). Oooh what a yummy looking cake! Another fabulous card Sue! Thanks for the chance at your blog candy!! What a great birthday card Love the birthday hat that you did the stamping on. LOVE how you used the flower soft, fantastic! Beautiful shape card, Sue! Love the texture you gave the cake he is shoving in! Adorable! I got a card inserted in a House Mouse stamp Happy Birthday. Super cute card. Looks like the Gruffy's enjoying the cake. Wonderful card and image. I love House Mouse..Thanks for sharing your fantastic creation. I enjoy your different headers, Sue! Love the party hat Sue. That Gruffie's really enjoying his cake isn't he? Thanks for the chance to win candy.